There was considerable media attention focused on the so-called “Supermoon” that appeared this weekend when a full moon reached its perigee and thus its closest approach to Earth this year, causing it to appear 12% larger than when it will be at its farthest point on January 14, 2014. However, in another part of the cosmos, a far more impressive display of galactic splendor is underway. 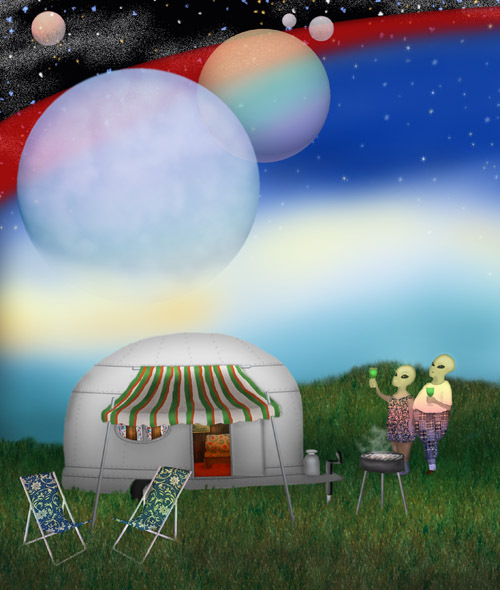 Here, otherworldly vacationers Bob and Sue have packed up their Airstream trailer and headed for the Ursae Majoris Hills to observe this year’s spectacular Epsilon Eridani planetary alignment.